Located at Chip Bee Gardens, Chez Petit Salut is the sister restaurant of Au Petite Salut, and it is a great option for causal dining if you are craving for French food. 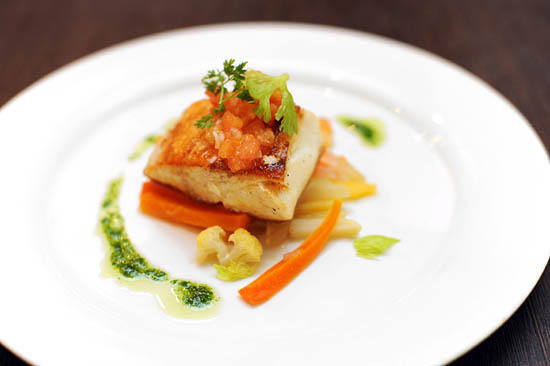 Like the main restaurant at Dempsey road, the French bistro offers two different set lunches: 3 course set lunch at $30++. 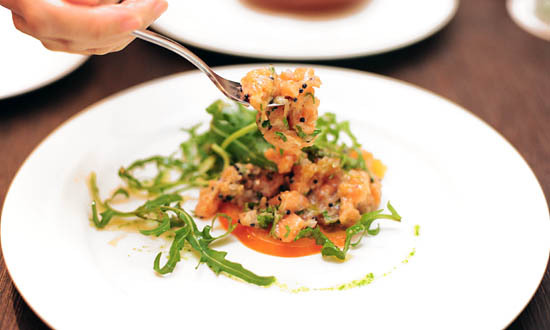 We had two normal 3 course set lunches and for starters, we had the Salmon Tartar, which was light and refreshing – the perfect appetiser to start our lunch. 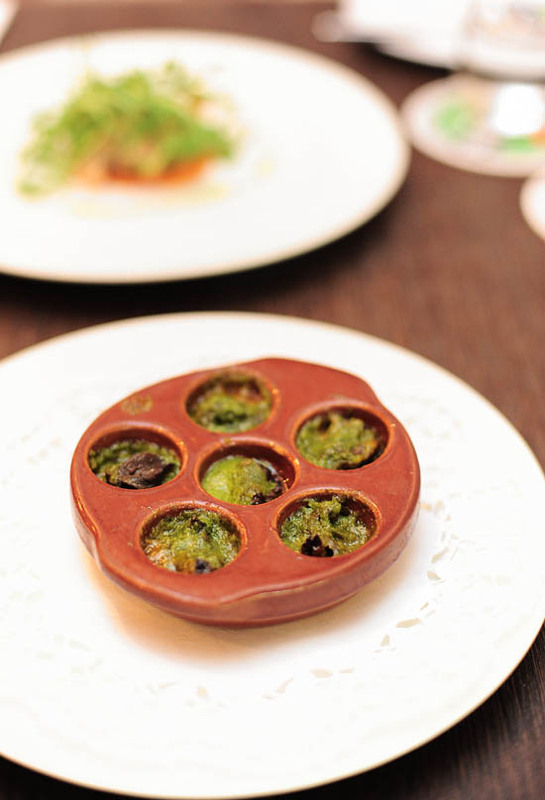 When it comes to escargot, there are typically only two reactions: a) I love it or b) eew snails are so disgusting! My lunch partner belonged to the latter camp, and refused to touch the escargot so I had everything to myself. It took us a while to choose the main course. You could have the excellent Onglet Beef with French Mustard Jus and mashed potatoes, or the Penne pasta with roasted vegetables, or the catch of the day. It is impossible to not be tempted by the Chicken Leg Confit and the Braised Lamb Shoulder, and it’s hard to say no to my favourite Mushroom Risotto. We eventually settled on the Mushroom Risotto and the Catch of the day which was an Escolar. The fish was very fresh and well-cooked, it fell apart nicely when we teased it with a fork. The portion was quite small for guys, but it is probably just nice if you don’t want to fall asleep in the office after lunch. As much as I love risotto, I’d usually avoid this dish when it comes to choosing a main course for set lunches. It seems a little silly to choose risotto when there are meat and seafood on the menu. 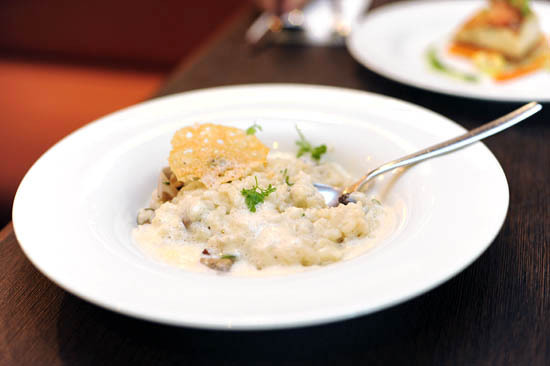 But I was glad that I ordered Chez Petit Salut’s Mixed Mushroom Risotto with light cream emulsion and Parmesan Cheese. It was rich, and creamy: thick flavourful rice done al dente, with the earthiness of the fresh mushrooms giving it an additional flavour. I think this is easily one of the best risotto that I had before. Amongst the six desserts available on Chez Petit Salut’s set lunch menu, we didn’t want the Fresh Fruit Salad, Homemade Strawberry Shortcake, and Financer with chantilly cream, so it left us to choose two desserts between the classic Creme Brulee, Choux Buns and Homemade Cheesecake. We agreed that the Gateau au Fromage Blanc was too good to miss, and since I had Au Petit Salut’s creme brulee before, we went for the Choux Buns with vanilla ice cream. 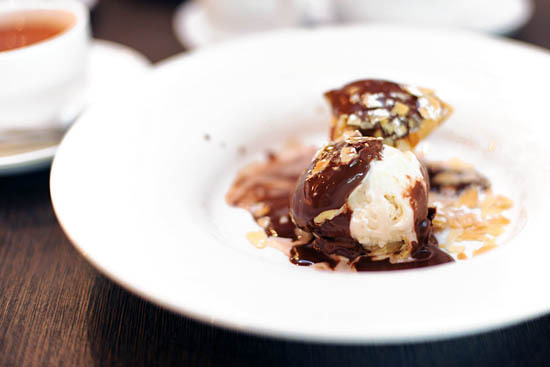 Filled with vanilla ice cream and glazed with a sweet and thick coating of chocolate sauce, the choux buns were gone before you could pronounce profiteroles. While they were not fantastic, we wanted to end the meal on a sugar high, and the Choux Buns did just that. 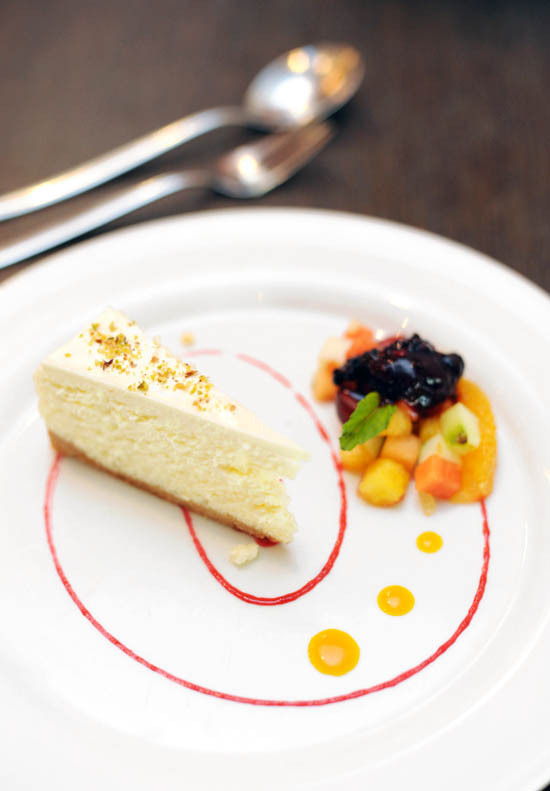 The Homemade Cheesecake was accompanied by a mixture of fruits, a delightful end to a great lunch at Chez Petit Salut. Hi B, is the set lunch available during the weekend? Thanks! Happy Chinese New Year, bro – and may it be filled with love, joy and many blessings! Wow this place sounds great for a nice Saturday lunch party. Thanks for this review! escargoes in a special – proper dish !! Our kids grew up with Petite salut as we went there for almost 15 yrs ..
P salut had never let us/our guests down !! menu .. for the set lunches/dinner prices. Was thinking of bringing hubby to french restaurant for dinner since its his bday. Would you recommend bistro petit salut or au petit salut?? Thanks. @Xiaowei both of them are under the same group. Au Petit Salut is slightly more expensive, but it has a different feel to it. Bistro Petit Salut, on the other hand, is more homely and cosy. I think both of them are great, so it really depends on what kind of ambience you are looking for.